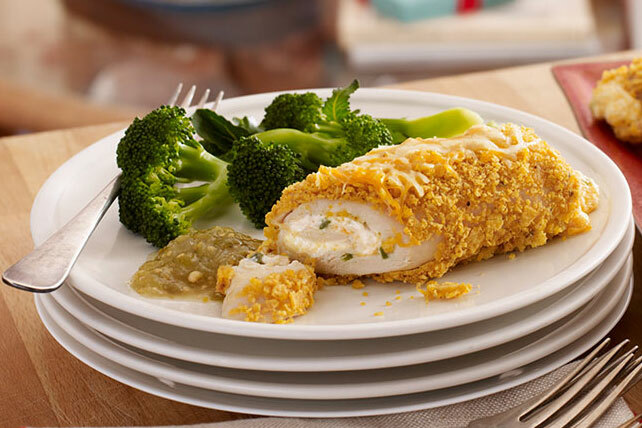 These cream cheese and jalapeño-stuffed chicken breasts are simple enough to make on the spot—but you can easily prepare them as part of a meal. Place chicken on work surface. Mix cream cheese, 1-1/2 cups shredded cheese and peppers until blended; spread onto chicken. Roll up tightly, starting at one short end of each breast. Refrigerate up to 8 hours. Prepare using PHILADELPHIA Neufchatel Cheese and your favorite KRAFT Mexican Style 2% Milk Finely Shredded Cheese. Serve with hot steamed broccoli. For more heat, do not remove the seeds from the jalapeño peppers before chopping them. Chicken roll-ups can be secured with wooden toothpicks before baking if desired. Discard toothpicks before serving chicken.